Our range of Biology equipment consists of the full range of Slides, Magnifiers, Slide Boxes, Simple Models, Charts and Specimens. We offer these products from not only our production but also from 3B Scientific, Germany. All kinds of prepared slides on different topics are available from us. Also available are slides boxes in wood and plastic. 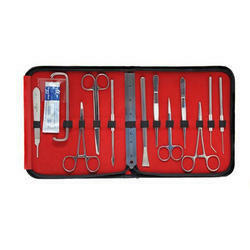 Dissecting Instruments are available in sets and separately as well.